Japan consists of four main and more than 6.000 smaller islands, of which Hokkaido is the second largest. It is also the northernmost island, representing 22% of Japan’s territory, however inhabited by only 5% of the total population. Hokkaido was considered a savage land for a long time, but its breathtaking landscapes endowed with crystal clear lakes, volcanic mountains, hot springs and waterfalls started to attract more and more tourists. National Parks offer a great way to explore the unspoiled beauty of Japan’s wilderness.This article aims to introduce the reader to the most beautiful national parks of Hokkaido, namely, the Shikotsu-Toya National Park, and the Daisetsuzan National Park. This Park is the most accessible one being close to Sapporo, which is the 5th biggest city of Japan. The Park boasts the most picturesque views of Hokkaido, and it is rich in hot springs, making it the most visited destinations of the island. Its name comes from the lakes Toya-ko and Shikotsu-ko, that represent the main attractions of the two principle areas of the park. 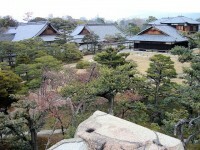 The third main area is situated on the North from Lake Toya-ko, centered on the Yotei-san conical mountain. Despite the fact that Lake Shikotsu-ko is just at one hour drive from Sapporo, its water is remarkably crystal clear. The lake is surrounded by volcanic mountains and it is a real paradise for tourists, climbers and for those who adore nature. Moreover, it is a popular fishing spot all year round. 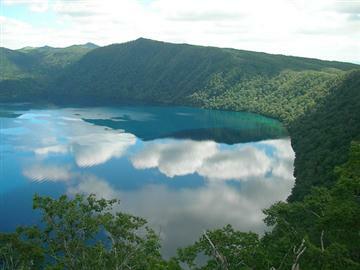 Lake Toya-ko is the smallest of the two. It has a small island in the middle that is home to a variety of wildlife, including the Ezo deer. 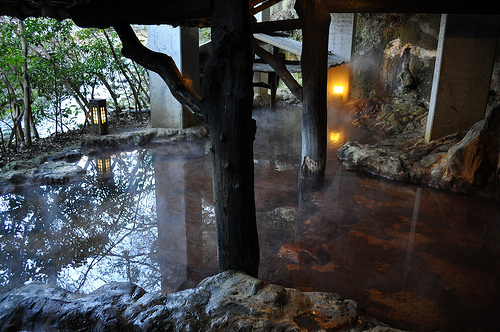 Its banks rich in hot springs attract people found of onsen (open-air public bath) throughout the year. 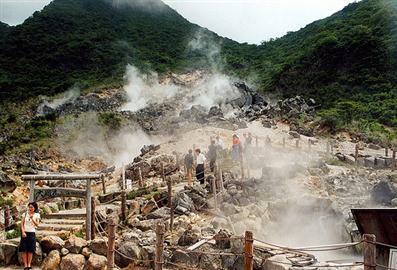 The most popular hot spring resort is Norobetsu Onsen, which boasts the largest volume of hot water in Japan. 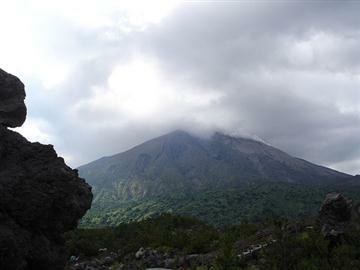 The Usu-zan active volcano must also be seen. The visitor can take a cable car to take a closer look at the volcano’s crater. The last time it erupted was in 2000, when large surrounding areas were evacuated. Thus you must contact local authorities to check whether it is safe to visit the park. Moving further to the South-East coast, we can find Shiraoi, a city famous for its Ainu village, proud of its most interesting Ainu Museum. 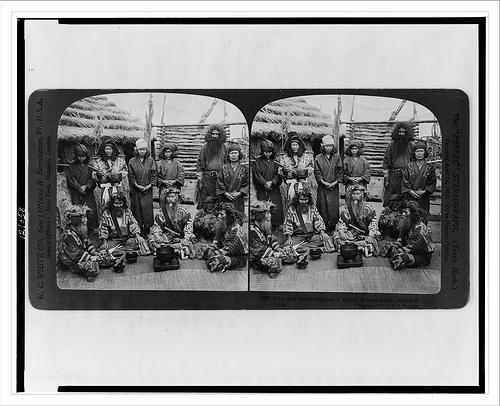 Japan’s indigenous people, Ainu, were the first inhabitants of Hokkaido. Having white skin and curly hair proves that they are not related to Japanese people. Moreover, their culture shares nothing in common either. 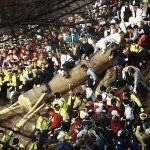 Located in the heart of Hokkaido, Daisetsusan is the biggest Natioal Park of Japan (2.300 km2). Its spine is made up from a chain of massive mountains known as the “roof of Hokkaido”, culminating in the highest peak of the island, of 1.290 m.
The Park and the mountains are also famous for their beautiful valleys, rocky ridges, spectacular waterfalls and moreover for their natural hot springs spread in the lap of the mountains. Very popular is the Sounkyo Spa situated on the North, which is also the starting point for various trips in the region. A perfect area for trips is the Sounkyo Defile, with its imposing landscapes of autumn and beautiful waterfalls, some even reaching a height of 150 m.
Just 40 km to the North from the park you can find Asahikawa, the second biggest city of the island. However it is not a popular touristic destination, it is an important transportation center, and many choose Asahikawa for accommodation. Yet, it would be a better option to stay exactly in the park, especially in an area that offers picturesque views, like the Sounkyo Defile. 50 km to the South from Asahikawa is Furano, which is a perfect place for winter sports. 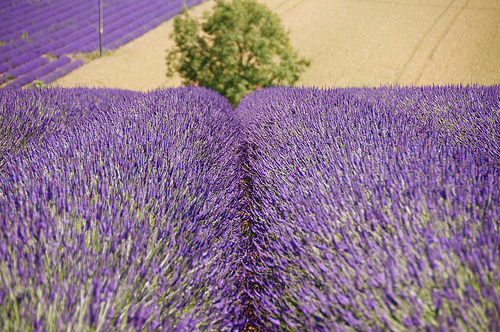 It offers beautiful sites and it is also a developed agricultural area, renowned for its vast fields of lavender. 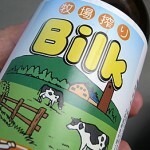 To conclude with, Hokkaido preserved the unspoiled natural treasures of Japan. There are not enough words to describe the beauty and peace offered by the island, that can only be experienced by climbing the volcanic mountains, taking a bath in the hot springs, breathing in the lavender-filled air and by getting lost in the never-ending purple fields of Hokkaido.